Every year, magicians from all over the world come to the MAGICOA Grand Market to buy new magic potions. 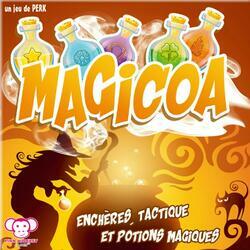 You will have to use cunning and malice to win the most coveted potions and thus become the most powerful magician! At the beginning of the game, you have 12 Gold cards containing from 1 to 12 gold coins. Each round, bet 2 Gold cards on 2 of the auctioned potions. Collect the magic points of the potions won to take the lead, or use the powers of your potions to gain an advantage over your competitors. Contents of the box : 37 Potion cards, 1 First Player card, 72 Gold cards.